80s clothing for 80s men & 80s ladies! Girls & Guys who want to have fun shop at Backward Glances for their 80s clothing! We’ve got so many crazy clothes from the 80s, and accessories, too, including original deadstock, never worn finds! Visit our 80’s ladies department for stirrup pants, Flashdance tops, legwarmers, party dresses, and more ladies’ 80s clothing! Our 80’s clothing Dudes department is rad! Visit for rockers, rappers,punks, preppies and nerds. You’ll find parachute pants,Member’s Only jackets, Cosby sweaters, and Thriller jackets! 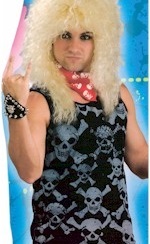 Put the finishing touches on your great 80’s outfit with a wild wig, gloves, hair accessories, belts, boots & more! 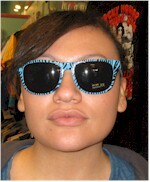 Visit our 80’s glasses department to complete your 80s clothing coolness!